The Ravens, working on an extremely short week, played three and a half quarters of sloppy football before pulling away from the ailing Browns. Ray Rice, setting the tone for much of the game, fumbled on Baltimore's first play from scrimmage, setting up an eventual Cleveland field goal. The Browns tacked on a 2nd Quarter field goal to lead 6-0 before Anquan Boldin, set up by a Weeden interception, caught a 40-yard TD pass to close out the half. Despite Ray Rice opening the 3rd Quarter with a 67-yard TD Run, turnovers kept the game close until midway through the 4th. Weeden's 3rd pick set up Baltimore on the Cleveland 21, which the Ravens cashed in for a TD on the next play. Another Weeden INT and another Baltimore's TD put the game out of reach. 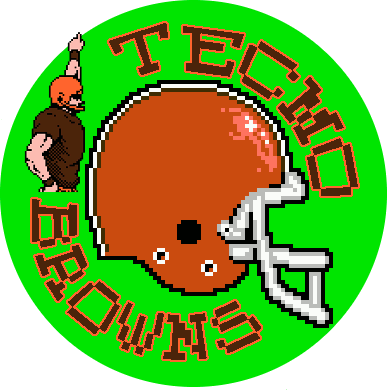 Much like the previous Sunday against Buffalo, the Browns defense played admirably, despite working on a short field much of the game. Jaabal Sheard's four sacks put him atop AFC, with Cleveland leading the NFL with 14 sacks. TSB 2013 Predicted: T.Richardson; 12 carries for 14 yards. What Happened: T.Richardson; 14 carries for 47 yards. TSB not only predicted Trent's troubles against a stout Ravens D, but also his value as a reciever; TSB predicted 43 yards receiving--Trent had 57. 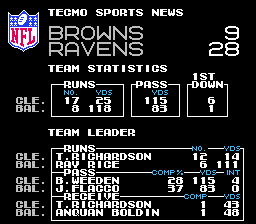 Weeden puts up decent yardage numbers, but Tecmo Super Bowl seems to be predicting, week after week, his below average completion rates and knack for throwing inopportune picks. Again, (and, having already simulated the entire season this trend troubles the Browns fan in me) TSB gets it mostly right. Stout Ravens D + Shaky Browns O = one sided game. Turnovers were indeed the Browns' downfall and the Ravens seemed to suffer from a short-week hangover.